All times are in GMT +12 :: The time is now 12:21 am. I have been asked to submit trace or log files with my support ticket, how do I create/locate those? When the EFILive application results in an error requiring investigation, a trace file may be requested for diagnostic purposes. To manually generate a trace file, generate the error in the V8 software, then open the EFILive Control Panel and navigate to [F8: Trave] and select [Save Trace]. Users can set the trace file name and save location during the [Save Trace] process. When the EFILive application reads or flashes a controller the details of the read/flash process may be saved in trace files for diagnostic purposes. YYYYMMDD: is the year, month and day that the trace was recorded. HHNNSS: is the hour, minute and second that the trace was recorded. T: is the mode and is one of R=Read F=Full-Flash W=Cal-Flash. htx: is the file extension. An example trace file name might be: 20180504_214334_F_E38.htx which contains a trace of a Full-Flash attempt on an E38 controller on May 04, 2018 at 09:43:34pm. Trace files can be managed using the EFILive Control Panel application on the [F8: Trace] tab page. Please make sure you select only the relevant file(s) based on the date and time in the filename. On some Windows configurations, holding down the Ctrl key while starting an application can cause the application to start as a minimized window with just an icon on the task bar. In that case, the user should expand the EFILive window by clicking on the task bar icon. EFILive has added the option to automatically save a trace file if/when black box reading or flashing fails. Available in EFILive June 2016 software release (or later), the auto-save feature is enabled by default. If/when BBR or BBF fails, the trace file is automatically generated and saved onto the FlashScan V2/AutoCal device provided enough space exists on the devices [Data] file system. The FlashScan and AutoCal devices maintain an internal buffer of the most recent messages sent to and received from the vehicle. That buffer is stored in RAM memory and is wiped clean each time the device is powered off or rebooted. Therefore you MUST save the trace file before powering off or rebooting the device. The support file will be saved in the "Scan" folder on the device, it will be called USR_xxxx.efx where xxxx is a unique number and can be retrieved using the V8 EFILive Explorer program. <desc> is one of upload (reading), download (flashing) or locking – depending on the action being traced. blx: is the file extension. An example trace file name might be: 20110604_214334_download.blx which contains a trace of a Flash attempt on a on June 04, 2011 at 09:43:34pm. Depending on the type of error, an error report may or may not be automatically generated. Automatically generated error reports will pop up on the screen. If the error report is not automatically generated, you can manually generate it by selecting the menu option: File->Generate error report or press the hotkey: Ctrl+G. Once the report is generated, click the [Save] button on the report to save the file. To force the EFILive V7 software to create and save a log file you must start the application with the command line parameter /l (forward slash, lowercase L for log) . To add command line parameters to the EFILive V7.5 software you must modify the application's shortcut Target field. 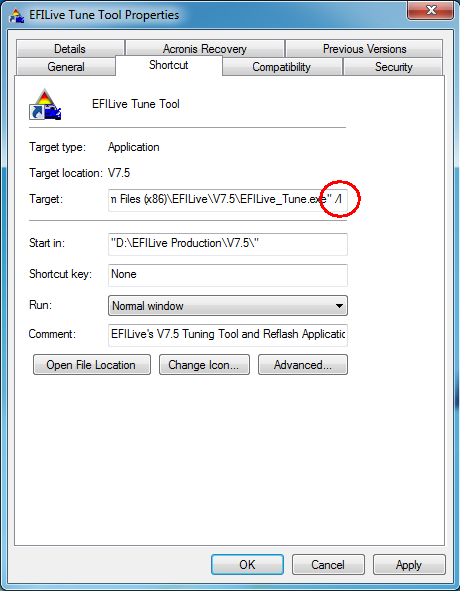 Then run the EFILive V7.5 software using the modified shortcut until you have reproduced the problem. The support file will be saved in the \Program Files\EFILive\V7.5 folder, it will be called StartupLog.txt. On some systems, the EFILive V7.5 application cannot create or save the StartupLog.txt file in the "Program Files" folder unless it is started with administrator privileges. To do that, right click on the EFILive desktop icon and select "Run as Administrator".